Today we released our update to the World Economic Outlook . An accumulation of recent data suggests that the global economic landscape started to shift in the second half of 2016. Developments since last summer indicate somewhat greater growth momentum coming into the new year in a number of important economies. 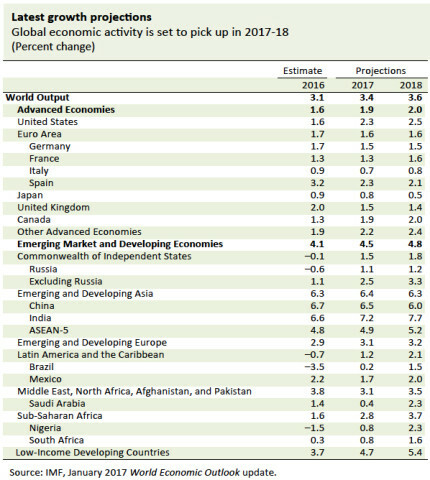 Our earlier projection, that world growth will pick up from last year’s lackluster pace in 2017 and 2018, therefore looks increasingly likely to be realized. At the same time, we see a wider dispersion of risks to this short-term forecast, with those risks still tilted to the downside. Uncertainty has risen. Our central projection is that global growth will rise to a rate of 3.4 percent in 2017 and 3.6 percent in 2018, from a 2016 rate of 3.1 percent. Much of the better growth performance we expect this year and next stems from improvements in some large emerging market and low income economies that in 2016 were exceptionally stressed. That being said, compared to our view in October, we now think that more of the lift will come from better prospects in the United States, China, Europe, and Japan. A faster pace of expansion would be especially welcome this year: global growth in 2016 was the weakest since 2008–09, owing to a challenging first half marked initially by turmoil in world financial markets. General improvement got under way around mid-year. For example, broad indicators of manufacturing activity in emerging and advanced economies have been in expansionary territory and rising since early summer. In many countries, previous downward pressures on headline inflation weakened, in part owing to firming commodity prices. A significant repricing of assets followed the U.S. presidential election. Its most notable elements were a sharp increase in U.S. longer-term interest rates, equity market appreciation and higher long-term inflation expectations in advanced economies, and sharp movements in opposite directions of the dollar—up—and the yen—down. At the same time, emerging market equity markets broadly retreated as currencies weakened. Of course, asset markets adjust not just to unexpected current events, but to shifting expectations of future events. Most commentators have interpreted the post-election moves as predicting that U.S. fiscal policy will turn more expansionary and require a swifter pace of interest rate increases by the Federal Reserve. Markets have noted that the White House and Congress are in the hands of the same party for the first time in six years, and that change points to lower tax rates and possibly higher infrastructure and defense spending. In light of the U.S. economy’s momentum coming into 2017, and the likely shift in policy mix, we have moderately raised our two-year projections for U.S. growth. At this early stage, however, the specifics of future fiscal legislation remain unclear, as do the degree of net increase in government spending and the resulting impacts on aggregate demand, potential output, the Federal deficit, and the dollar. There is thus a wider than usual range of upside and downside risks to this forecast. A sustained non-inflationary growth increase, marked by higher labor force participation and significant expansion of the U.S. capital stock and infrastructure, would allow a more moderate pace of interest rate increases in line with the Federal Reserve’s price stability mandate. On the downside, if a fiscally-driven demand increase collides with more rigid capacity constraints, a steeper path for interest rates will be necessary to contain inflation, the dollar will appreciate sharply, real growth will be lower, budget pressure will increase, and the U.S. current account deficit will widen. This last scenario, one with a widening of global imbalances, intensifies the risk of protectionist measures and retaliatory responses. It would also imply a faster than expected tightening of global financial conditions, with resulting possible stress on many emerging market and some low-income economies. Some emerging and especially low-income commodity exporters could benefit from higher export prices, but importers would then lose. The details of the U.S. policy mix matter; and as these become clearer, we will adjust our forecast and spillover assessment. Among emerging economies, China remains a major driver of world economic developments. Our China growth upgrade for 2017 is a key factor underpinning the coming year’s expected faster global recovery. This change reflects an expectation of continuing policy support; but a sharp or disruptive slowdown in the future remains a risk given continuing rapid credit expansion, impaired corporate debts, and persistent government support for inefficient state-owned firms. At the global level, other vulnerabilities include higher popular antipathy toward trade, immigration, and multilateral engagement in the United States and Europe; widespread high levels of public and private debt; ongoing climate change—which especially affects low-income countries; and, in a number of advanced countries, continuing slow growth and deflationary pressures. In Europe, Britain’s terms of exit from the European Union remain unsettled and the upcoming national electoral calendar is crowded, with possibilities of adverse economic repercussions, in the short and longer terms. We continue to recommend a three-pronged policy approach relying on fiscal and structural policies alongside monetary policy, but one that is tailored to country circumstances. Some advanced economies are now operating at close to full capacity, for example, Germany and the United States. In these, fiscal policy should focus, not on short-term demand support, but on increasing potential output through investments in needed infrastructure and skills, as well as supply-friendly, equitable tax reform. Policymakers in these economies should also turn their attention to longer-term fiscal sustainability, while monetary policy can follow a data-dependent normalizing path. Structural reform remains a priority everywhere in view of continuing tepid productivity growth, although in many cases appropriate fiscal support can raise the effectiveness of reforms without worsening governments’ fiscal positions. Financial resilience is another universal priority and requires stronger financial regulatory frameworks, better focused on key problem areas. Countries can do much on their own to improve financial oversight and institutions, but not everything, and continuing multilateral financial regulatory cooperation is vital. Social dislocation due to globalization and, even more, to technology change is a major challenge that will only intensify in the future. One result has been wider inequality and wage stagnation in many countries. Rolling back economic integration, however, would impose aggregate economic costs without reducing the need for government investment in well-trained, nimble workforces, along with policies to promote better matching of available jobs to skills. On this Martin Luther King Jr. Day in the United States, we do well to acknowledge a key takeaway from 2016: sustainable growth must also be inclusive growth.